So maybe you have the dream of starting a podcast, recording an album or live streaming your DJ sets on the internet. Enter the PreSonus Studio 26, the 2x4 USB 2.0 bus-powered audio/MIDI interface that can record up to 24-bit, 192 kHz audio. Complete with some seriously good spec including PreSonus XMAX-L solid-state preamps and high-end converters, you are guaranteed audiophile quality recording every time. The Studio 26 is a superb choice for anyone that has a need to record and playback audio using their Windows or Mac. Such is the low-latency that you can jam with musicians over the internet or even teach a student on the other side of the world. For the DJ's, the headphone out supports cue A/B mixing so you can toggle between two mixes for perfect beat-matching. For the vocalists, the Studio 26 supports true +48V phantom power so if you have a really high-end microphone, no problem - just plug into any of the mic/inst/line combo inputs and lay down a vocal that will digitally replicated with audiophile grade quality. 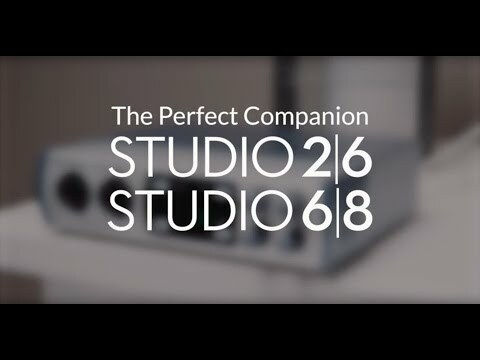 The Studio 26 was designed to work with any digital audio workstation that you use but it also comes bundled with a license for Presonus' own Studio One Artist giving you a complete digital recording and production suite right out of the box. In addition, the Studio 26 also comes with the much revered Studio Magic plug-in suite giving you some incredible tools to develop music including effects and virtual instruments. The Presonus Studio 26 Audio Interface hits the sweet spot of permanent studio quality sound in a unit that was built to hit the road hard. Musician, producer or both, the Studio 26 is the perfect companion.